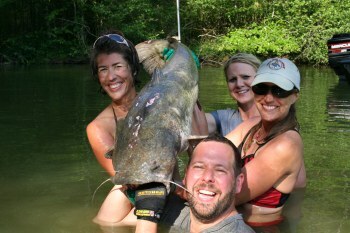 Showtime Eric Young participates in the art of noodling, where fishermen catch catfish with their bare hands and feet. Then, fishing expert Dwight Taylor teaches Young how to “jug,” a technique that reels in catfish with empty soda cans. Click Picture to view CNN video. In each episode of Trip Flip, professional fun-seeker and travel expert Bert Kreischer convinces two random people to spontaneously agree to a 3-day surprise vacation. Bert brings a unsuspecting couple from California on a grabblin trip! 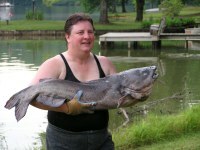 The crew from CNN went with Catfish Grabblers, check out the article a Fistful of Fish for the fourth. 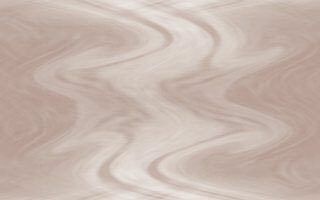 Also check out the article on eatocracy! The Travel Channel and Bert the Conqueror! Brock Lesnar of the UFC with the ladies of Girls Gone Grabblin! Get all 3 DVD's for one low price. Girls Gone Grabblin 2! with special guest stars Phil Keoghan from the Amazing Race, Jackie Bushman of Buckmasters & Joella Bates, World Champion Archer. and Phil Keoghan goes grabblin with the Girls Gone Grabblin Crew. Joella Bates is a World Champion Archer. She is also the first woman to take a Cape Buffalo with a bow! Girls Grabbling or Noodling featured on ABC World news tonight! The winner of the 2005 Bronze Telly Award!! 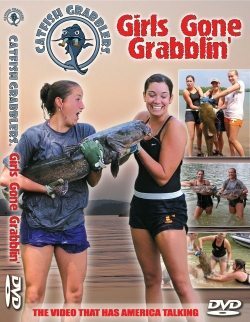 View video clip --see great action of the girls grabbling, noodling! 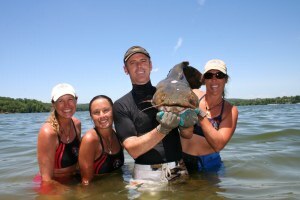 Make sure to check out all of the great articles written about some of the great grabbling or noodling adventures featured on our links page.